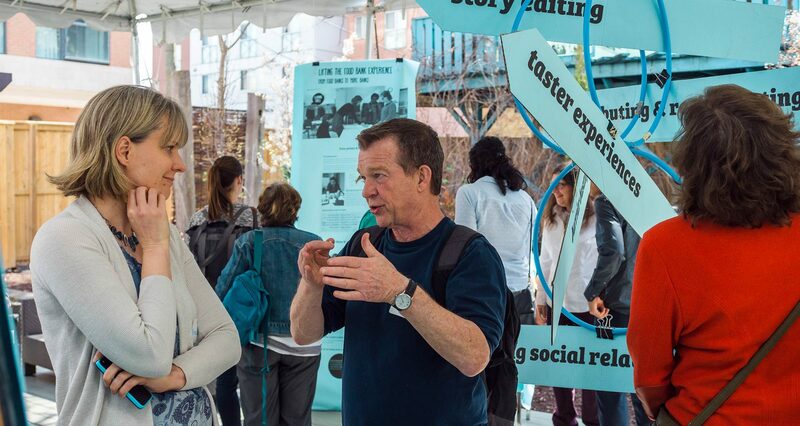 The Learning Circle is a six-month facilitated introduction to design and social science methods. Learners work through a social challenge relevant to their contexts. A mix of structured lectures, DIY exercises, and 1:1 coaching culminates in original user research, a prototype, and a public demo day to share insights. A duo recruitment process. Participants were recruited through social media and peer networks. Pairs were asked to apply by writing a joint purpose statement. A new curriculum. Twelve 3-hr modules were developed to introduce user research, segmentation, analysis, idea generation, experimentation, and storytelling. A set of teaching materials. Rather than teach tools, we taught ‘use cases’ with storybooks outlining how tools were used in context. A demo day. Learners unveiled their prototypes at a celebratory public event designed to increase ownership & pride over their learning. The Learning Circle was a one-time prototype. The curriculum modules and teaching tools are now being used across our work, and informing our next experiments with adult learning. Despite increasing awareness of new problem-solving approaches, we keep hitting an implementation gap. Practitioners tell us they don’t know where to start, nor do they know what a quality process looks like. There is a growing market of webinars and online toolkits, but they mostly deliver information. They aren’t modeling contextually relevant design and social science methods, nor offering a feedback loop. We looked to the literature on adult learning (fun fact: this is a discipline called andragogy) to help us design the Learning Circle. Adult learning theory focuses on the application of knowledge, and creating space for learners to reflect and reconcile prior know-how. We used project based learning techniques, case studies, and peer-to-peer feedback to try to balance the old with the new. Modeling and feedback were the primary mechanisms of change. Modeling and rehearsing is used within informal social networks to ‘teach’ new kinds of behaviours. It’s all about showing, not telling. Making change visible is a powerful motivator or reinforcer of behaviour. Most of the time, people are in the dark about how they are doing. To learn more about change mechanisms, read our white paper. We prototyped the Learning Circle over a six-month period with 25 participants from social services, government, and a foundation. 21 participants completed user research and prototyping. 11 pairs presented prototypes – including a new wait list intervention; a more human intake process; and a new format for family consultations. 75% reported seeing their challenge and user group from a new perspective. Still, the majority of participants struggled to allocate 3-hours a week to their learning process. And about half of the participants found that their organization was not ready to integrate the approach. The Learning Circle had less structural impact than we had hoped. The Metcalf Foundation generously supported The Learning Circle. Maggie Greyson and Sarah Schulman were the little team that could. Round pegs in square holes? Want to know more about our offer around learning? We regularly share our experiences.